Are You HIDING Your HORRIBLY Matted Tangled HAIR? Well, we know it’s not your fault… Not all hairdressers share the same care about hair. When women seek the assistance, advice or service of a salon or cosmetology school to resolve horribly matted tangled hair. Many times hairdressers or cosmetology students are not encouraged to take the time needed to even attempt to detangle a client’s hair. They only offer advice that makes their job easier…CUT. Which obviously is not about catering to the client’s needs at all. Medical students are exposed to emergency care units during their residency training, because it is a very important aspect of practicing medicine and saving lives. 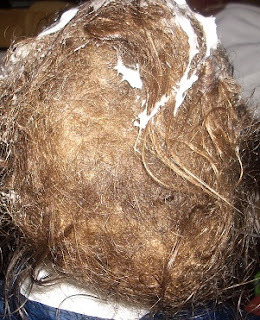 Cosmetology students need to be trained in emergency hair care treatment for saving very tangled matted hair. Every hairstylist will inevitably experience having one or more clients seeking help for this issue. 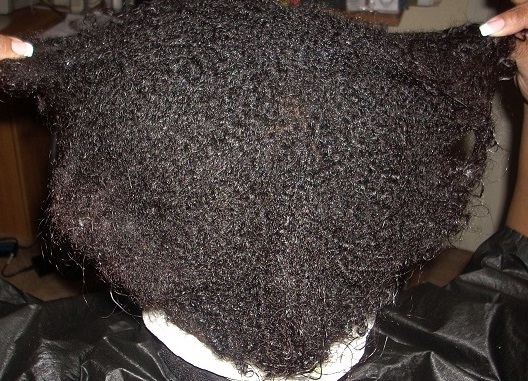 While the increase of women deciding to transition from relaxed hair to natural hair, or the removal of protective hairstyles, such as braids, weaves, dreadlocks and hair extensions; has caused more matted tangled hair issues. It is evident that not all hairdressers share the same care about hair. We are very distressed as my 9 year old hair us very tangled. We are practicing Sikhs and can not cut his hair. We have been working on this for a whole week. He has to go to school on Monday. I have watched your videos but used other products but same method. I did not know where to order the products. Luckily I found your site. Can you come this weekend to untangle his hair. Or we will come tomorrow? Yours G.
I'm from Michigan. I really need help with my hair. It's a tangled and matted mess. This past July my daughter was stillborn and I almost died myself. I was 8 months pregnant and developed a rare condition known as fatty liver of pregnancy. I am very lucky to still be here to take care of my other daughter who is a little over a year old. After I lost my baby I became depressed and was still recovering physically from the trauma as well. I basically stopped caring about taking care of myself and just let everything go including my hair. I just put it up in a messy bun and didn't brush it. When I finally decided to try to do something about it I was unsuccessful. I got so frustrated and overwhelmed. I NEED HELP!! I am hoping there is someone who can come help me get this out! 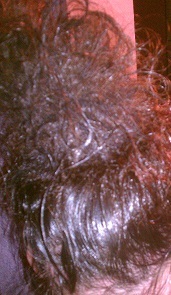 I can't live with my hair this way anymore. It's so uncomfortable and just plan embarrassing. Please tell me there is hope. I'm so afraid that I'm going to have to shave my head. I feel like if I had to do that I would just slip back into the deep dark depression I was in before. Please contact me back and let me know if there is anyone in my area who can help me. Hello I am 19 years old. I got pregnant at 18 and we dumped by the guy. I went into a severe depression and almost lost my son, in that time (about 3 months) I didn't brush my hair I kept it in a knot bun on the top of my head. I was in and out of hospitals and since he left me I debt care about how I looked I just felt worthless. Now I have my son and me and his dad got married in October and I've slipped into another depression because my marriage is as stale because of my hair. I am humiliated and mortified that I have let myself get so bad. Please help me!! I have prayed and cried and begged no one else will even attempt to help. Is there anyone in Arkansas?